Artists of Utah recently announced the beginning of Round 2 of Utah’s 15, their project to celebrate Utah’s most influential artists (click here to learn about Round 2 of Utah’s 15. 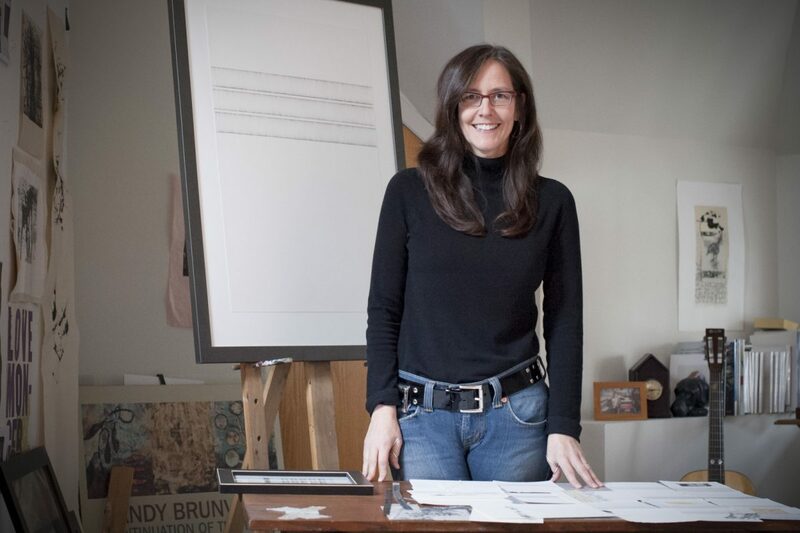 ).In 2013, Sandy Brunvand was selected by 200 of her peers as one of “Utah’s 15 most influential artists.” The following profile appeared in Utah’s 15: The State’s Most Influential Artists, published by Artists of Utah in 2014. A work of art by Sandy Lynne Brunvand might be no bigger than a postcard, yet be glued, stitched, or even stapled together from several drawn, handprinted, or found elements. Or it may be as tall as the viewer, a single huge leaf of paper hung out like a drying bedsheet, on which calligraphy ascends like a forest seeking sunlight. The lines—there will always be lines—may be indelibly inked on parchment in a manner both painstaking and tenuous, or they may be boldly printed, over and over, across one another and the page, until their identities merge into a black-and-white texture, like a micro-photograph in which the eye searches for secrets concealed in plain sight. The colors come from natural pigments, subdued reds and greens, or metallics, or a range of blacks including as many varieties as any other hue. They may outline a tiny plant found alongside the trails where the artist hikes daily with her dog, or limn the dog himself, or discover a bird in the brush. Or they may abstract and explore the neurological-mathematical alchemy whereby dots become lines, and lines formulate space. Either way, the muscular, physical presence of the artist is foremost. “Write what you know,” she quotes the oldest advice to writers, using the verb ‘write’ metaphorically, but ‘know’ quite literally. Brunvand doesn’t deal in illusions. Whether it’s the medium, the form, or the content, her visions dwell in facts. Galleries today are full of artists who prefer sending messages to sharing the visible world, who reinvent themselves every time out, seeking new subjects and methods that they handle tentatively and drop quickly. Far rarer is the artist who regularly revisits her familiar motifs, drawing from them new discoveries and new expressions. The first foregrounds his range rather than his insight, and may sacrifice permanence for brief notoriety in the world. The second concentrates on the eternal qualities she finds embedded throughout time in endlessly varied iterations. While Brunvand dresses with the chic of a successful artist who is also a role model for aspiring young professional artists, she somehow recalls an era before her time: the so-called counterculture of the 1960s. Her appearance plays a part in it: Wisconsin-bred, she wears her long hair loose and fetchingly shaggy, doing without makeup or this year’s fashion in eye wear, all conveying a level of comfort with herself. She has nothing to prove. But as much as anything, it’s her open, outgoing manner and toothy, off-center grin, backed by playful mannerisms she seems to have picked up singing in front of a Bluegrass band, that create the impression of having stepped through a time warp. Maybe part of this aura comes from her backstory, which she anchors in an early avocation to work in clay. Like the Pre-Raphaelites of a century ago, who also emerged into an arts-and-crafts revival, she must have realized along the way that art should be a part of everyday life, serving to elevate those who live with it actively, rather than show off the higher status and discerning taste of wealthy collectors. Not surprisingly for someone with such democratic principles, eventual success in the arts led to her involvement in public projects and arts education. Her participation in founding and operating Saltgrass Printmakers a decade ago was intended to make access to the challenging, specialized equipment used in this demotic, but semi-industrial art available in a practical, liberating way to anyone who wanted to participate. A journalist might conjure in the reader’s imagination one of Salt Lake’s more popular artists, dressed down in blue jeans and a head scarf, crawling along on all fours, adjusting an expanse of paper over a half-sheet of inky plywood, then jumping behind the controls of a massive road leveler and driving it across to produce a wall-size print…but it’s not really necessary to imagine, since such events occur annually in the Saltgrass studio’s parking lot, open to those who come to witness as much as to those who come to make their own prints. Before that could happen, though, or before Brunvand could begin teaching university art students how to approach materials differently from a scientist or an engineer, she had to overcome a potentially devastating physiological challenge. Clay is dumb stuff and resists the artist as much as any other sculptural material, but unlike metal or stone, which are worked primarily by power tools, clay is exalted by direct manipulation. Even before the expressive work begins, much of what ceramic materials require—like wedging to remove air bubbles—demands brute strength. Here, though, and at the beginning of her career, Brunvand’s hands betrayed her, and the experts she consulted told her there was a limit to the total amount of work she could extract from them before her compromised joints eventually but inevitably gave out. To her credit, she figured out what they were really telling her was she would need to find ways of getting the most art out of the fewest, least-destructive manual motions. Searching about for means of expression that would spare her hands led Brunvand away from the plastic and three-dimensional worlds of sculpture, installation, and assemblage, which were the hot arts of the new millennium, back into the problematic but accessible realm of paint. It may be significant that Chuck Close, one of the few recent painters to make his style last a lifetime, was also challenged by physiological limits. His predicament proved far more devastating than Brunvand’s, but, like her, he was forced deeper into his art, rather than away from it. In both cases, self-rescue was made possible by a little-noted fact about art making and artists. What artists do is athletic, but unlike athletes, what artists do is not limited by choice of medium or focus on a physical attribute. While it may have frustrated her for a time, Brunvand’s change of mediums made her a different, rather than a lesser artist. Forewarned, then, Brunvand was able to reset the clock counting down her artistic career, while at the same time channeling her creativity into less familiar activities that repaid her in a variety of ways. In hindsight, it appears as though each labor-saving discovery she made also played a synergistic role in her art. For instance, rather than hand-fabricate components that would restore the third dimension to her work, she began collecting odd, found objects that spoke to her, which inclusions allowed her 2-D work to hold its own among her fellow artists’ ambitious assaults on traditional media. Bits of old fencing wire she found on her walks, or the dog hair that proved plentiful thanks to the participation of her hiking companion, not only provided an experimental angle, but added contrasting linear elements. The former she might embed in beeswax-filled coffers inserted into the supporting panel of an assemblage; the latter might be bagged and pinned to the wall as part of an installation. The best example of this synergy shows up in her work with Saltgrass Printmakers, the cooperative studio and gallery she co-founded in 2003 with her husband, Eric, and the preternaturally gifted paper artist Stefanie Dykes. Saltgrass links Utah to the worldwide network of printmaking artists. Along with its centuries-younger cousin photography, printmaking is fundamentally an industrial technique. Both mediums share enormous versatility, and both have become ubiquitous: in fact, they are the dominant way we see most things, including the rare, the remote, and the imaginary, including more artworks than a lifetime of viewing could permit. Prints, however made, proceed on two very different levels: as copies, but also as originals in their own right. At Saltgrass, Brunvand has access to the full range of print, from small, hand-rubbed thumbnails to works done entirely on an electrically powered, mechanical press. The ability to make duplicate originals, which despite such innovations as mono-printing remains an integral part of printmaking, allows for art that at the high end is more affordable than paintings, sculpture, or installations, and at the low end can even be disposable, as are the transfer prints and stickers used by street artists. One process that recently “went viral” among printers is chine collé. Printer paper is usually a compromise between thin, flexible material that can take fine detail and thick stock that makes a durable print. In chine collé, the printer solves this dilemma by printing on delicate paper, then collaging it into another print done on heavier paper. Telling artists when to stop bears comparison to herding cats, and the uses for chine collé have multiplied beyond counting. For instance, frottage— placing paper over a textured surface and rubbing with a pencil to produce an analog of the original—is a popular and accessible technique often discovered by children, who enjoy seeing something realistic emerge from their untrained efforts, or by adults when they produce a rubbing of a coveted engraving. These are uses Brunvand might demonstrate in the public schools or at Saltgrass, making an instant hit either place. Frottaged images made with delicate paper can show remarkable detail when layered onto a print using the chine collé technique. Like she had earlier with found objects, Brunvand has made chine collé a major element of her work, wherein she lends it even greater significance by assembling translucent layers that speak in sophisticated ways. Layers produce overlap, which is one of the most important of those ways our brains have of determining what is close and what is farther away. The ability to read through one image to another generates an analogy for her fundamental vision: a world composed of simultaneous processes going on in overlapping spaces. After all, who doesn’t recognize how beneath what is happening obviously, on the surface, events are occurring that may be far more important, or which give the more celebrated, popular things they underlie their vital meanings. Under the canopy of trees are smaller plants, within which birds hunt seeds that sprout new plants. In one of Brunvand’s works, all this might exist in a collapsed space that the eye and mind insist on reinflating. Another example, one that is particularly important to Brunvand, is the role, the presence within all this life, of death. There are few more marked contrasts than there are between life and death, and it’s not necessary to consult Brunvand’s statements to find that their coexistence is part of her vision. The tiny trailside plants that she enlarges into dramatic, exquisitely calligraphic line drawings could be alive, could even be ready to reproduce, but they could also be the cellulose skeletons of plants left after their chlorophyll has decayed. Life is so often found in the manner of green shoots springing from carrion, and such visual contrasts are the mulch from which spring Brunvand’s private thoughts. These she rightly chooses not to share— artists who lecture about their personal views abuse their audience—but to make accessible by foregrounding reordered views of dead and living matter. Her work has a narrow focus, compared to artists who interest themselves in society, in satire and in celebration of dizzy human interactions, or those who prefer the look of nature, rather than the present fact. It comes as no surprise, then, that her images display abstract elements. All art abstracts from its subjects; all abstraction strives to pull a pattern from a cloud of facts. For some artists, death is the inescapable fact. For others, the same can be said for life. For Brunvand, it’s the porosity of the wall that seems to divide them. Life continuously remakes itself through the processes of death, decay, and renewal. Such a course of events lends itself to allegory in her works, where contrast between rising and descending forms, cool and warm colors, and a universe of black pigments on variously white grounds doesn’t quite conceal how the spore of mortality is present within all life. If that sounds negative, it shouldn’t, for the simultaneity of the image presents grounds for something better than faith. If death is ever-present, then so is life. The suspense found in the dramatic image is the truth made visible. In the popular image, the artist is either a genius or mad: maybe a bit of both. Such artists get little credit for the visions they merely channel and don’t understand, and none at all for making sound decisions and building an orderly life. Sandy Brunvand gives the lie to each point of this image in its turn. While her desire to make art must have started early, in school she made the realistic decision to earn the teaching credentials that would enable her to support herself. Today, she still teaches part time, but given her artistic and professional status, she largely teaches other art teachers at the University of Utah, Art Works for Kids, and Saltgrass Printmakers. Her choice for a life’s partner was neither a would-be-great artist in need of an art wife, nor a successful businessman who generously supports but doesn’t really understand her. As a professor of computer systems and communications, Erik Brunvand hangs his hat in the technological end of art. His interests in digital design and collaboration with artists in conventional media, along with his mechanical know-how, made him an essential part of the Saltgrass troika. His own prints complement his wife’s in counterintuitive ways: more involved with the varieties of visual information, less technically demonstrative. And he performs bluegrass music, holding open a spot for a singer when the spirit moves her. Together, they own an elegantly restored home in the Avenues that they thought to acquire at a point in life when many people, not just artists, still view themselves as bohemians. Her studio, in the former attic, combines the traditional light, high-ceiling spaciousness, and Parisian romance of a garret with practical layout and modern materials. When she wrote, “My work is of this place in which I dwell,” she clearly meant Utah, her chosen home for over three decades. But she might just as well have meant the place she created for herself: a place suited to a rich life of the mind and body, to celebrate that life in art, but most of all, to live it.